Elite Nails Hand, Foot and Body Spa: Skin Whitening Package: Rock 2013 with a fairer skin! 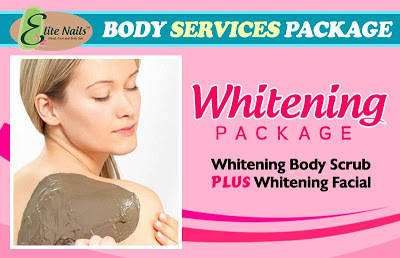 Skin Whitening Package: Rock 2013 with a fairer skin! Keeping up with a demanding schedule everyday more often neglects your “Me” time and the accumulated stress results to having a stressed skin as well. Add the factors of sunlight whenever you have to be on the field for work, the unhealthy eating choices because of lack of time and missing your gym or yoga appointments more often, these and more will take the glow away from your skin from being amazing. I know that is not such a good idea to start the year. We all have to look great at all times for it attracts everything else great next. Start to have a fair and healthy skin from top to toe with Elite Nails’ Whitening Package promo. Experience pure organic bliss and indulge your skin with the healthy goodness of skin whitening treat. Achieve youthful, firm and glowing skin with our whitening facial right in the comforts of your neighborhood spa. 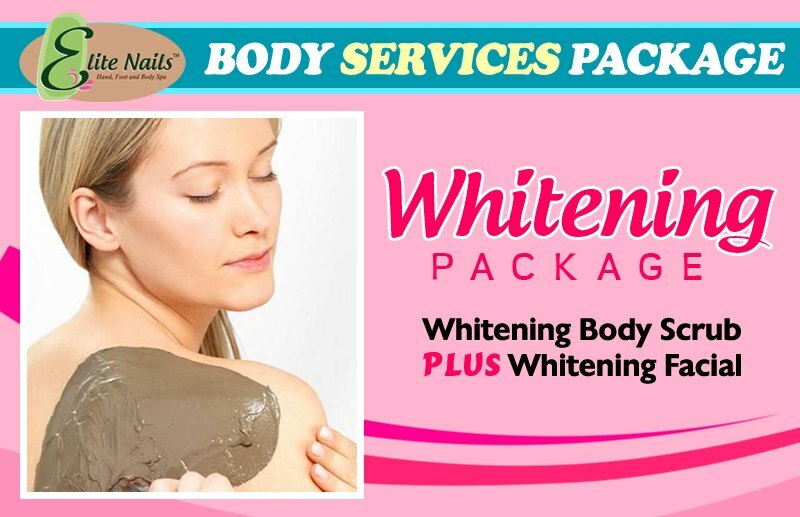 For only P850, you get total indulgence of a whole body scrub and facial with whitening benefits, how about that? Who says we can't be generous after the holidays? Elite Nails spa will always have delightful offers for you, your family and friends. This is indeed an offer not to miss, book your appointment now! For reservations, you can call these numbers - 09336537276, 09215918801, 09178086950 or at (02) 480-6832. You can also get updates online via our Facebook fan page and at Twitter (@eliteNailsSpa) too.